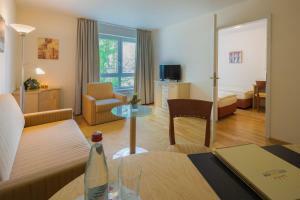 These spacious apartments with spa and pool are situated to the north of the centre of Hamburg. 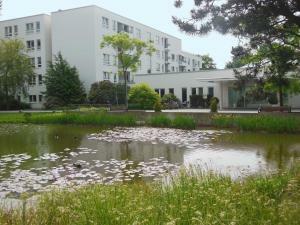 They are 500 metres from Hagenbeks Tierpark zoo and a 16-minute train ride from the centre. 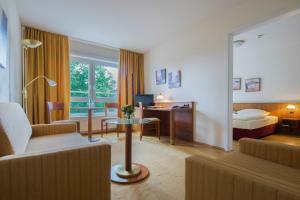 The NewLivingHome Residenzhotel Hamburg offers elegant apartments with kitchen. The apartments are between 30 and 50 m² in size and are suitable for up to 4 people. Plates and kitchen equipment are available for a small extra fee. Breakfast is served in the conservatory of the NewLivingHome. Coffee and cakes are offered here in the afternoons. 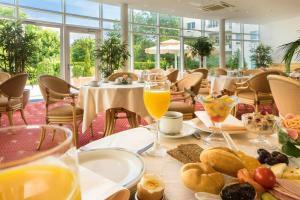 International and regional dishes are available in Mendelssohn’s restaurant. There is also a lobby bar. The spa area includes a swimming pool, sauna, solarium and gym. Guests can also relax in the library or drawing room. A bus stop is just outside the apartments and an underground station is a 2-minute walk away.